LifeSaver has a very deceitful name. At first, you might think that this program is exactly what you need, but, sooner or later, you will regret installing it. This supposedly beneficial shopping assistant is just another advertisement-supported program that does not deserve your trust. You should not use this program to shop online, and you should not rely on it to provide you with authentic deals. The only thing you should do is remove LifeSaver, and this removal guide was created to explain the reasons behind this. The sooner you delete this misleading adware, the better, and you should continue reading to learn more about this process. 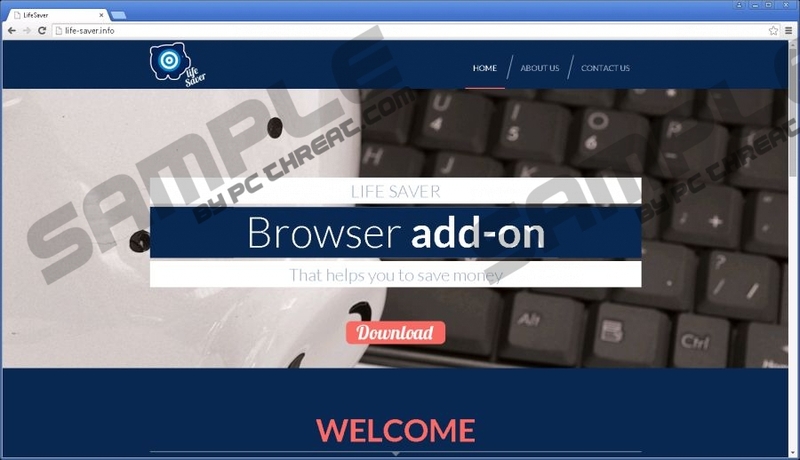 Our researchers indicate that LifeSaver was built using the Justplugit engine, the same engine that was used to develop CoupontasticOffers, DelightfulDeals, AdPunisher, and other removal-deserving adware. Unlike most of its clones, LifeSaver has a website representing it, life-saver.info. Although the installer does not work – and we are not surprised – this website is important because it discloses important information. For example, did you know that this adware can collect personal information? We are sure that if you knew this, you would not have installed this unreliable program onto your operating system. Needless to say, the collection of private information is an important reason to delete LifeSaver. As we now know, the LifeSaver installer on its official page does not work. The thing is that most ad-supported programs associated with the Justplugit engine are distributed by Installrex, Amonetize, and other suspicious third-party installers. These installers also spread potentially unwanted programs and browser hijackers (e.g., oursurfing.com). This removal guide discusses the removal of LifeSaver, but you also need to delete any other active threats. First, employ a malware scanner to learn which threats these are. Then, find appropriate removal guides on our website. There is a great alternative to this complicated and lengthy process, and we discuss it further in this report. The existence of LifeSaver reveals a few things about your activity and your virtual security. Since this adware travels in bundles that are usually promoted on unreliable file-sharing sites, it is likely that you are careless when browsing the web or acquiring software. As you now know, this kind of activity can lead to the infiltration of malware, which is why you have to rethink your activity online. The existence of LifeSaver also reveals that your operating system is weak. If you do not reinforce it, you might have to remove malware again and again. Note that next time you might have to delete much more dangerous threats. If you do not have the experience to delete LifeSaver and the associated malware manually, we offer installing a reliable antimalware tool, SpyHunter. This tool not only deletes malware automatically but also blocks incoming malware. Therefore, if you install this tool, you will not need to worry about the attacks or the malicious activity of dangerous infections. If you prefer the manual removal option, remove LifeSaver using the guide below first, and then move on to other threats. Find the unwanted application, click it, and select Remove. Enter Control Panel into the RUN (tap Win+R to launch) dialog box. Select Uninstall a program and find LifeSaver. Identify the app you want to delete, right-click it, and choose Uninstall. Select Add-ons and move to Extensions. Quick & tested solution for LifeSaver removal.